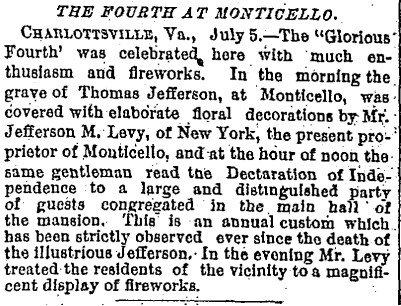 ‘ALMOST A DESERTED RUIN’: In my now twenty-year quest to document the post-Thomas-Jefferson history of Monticello, I continue to find newly digitized first-person accounts of 19th century visits to the mountain. 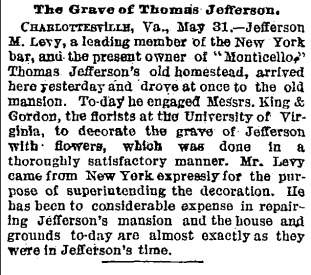 I feel gratified to report that these new (to me) primary sources confirm what I wrote about the condition of the place following Jefferson’s death in Saving Monticello. The latest case-in-point: An article that appeared in The New York Times on March 11, 1866, about a year after the Civil War ended, a time when Monticello was under the care of cantankerous caretaker Joel Wheeler. During this time, the two partition lawsuits filed by Uriah Levy’s heirs (he had died in 1862) were very slowly wending their way through the courts and the house and grounds suffered greatly under Wheeler’s not-so-benign neglect. 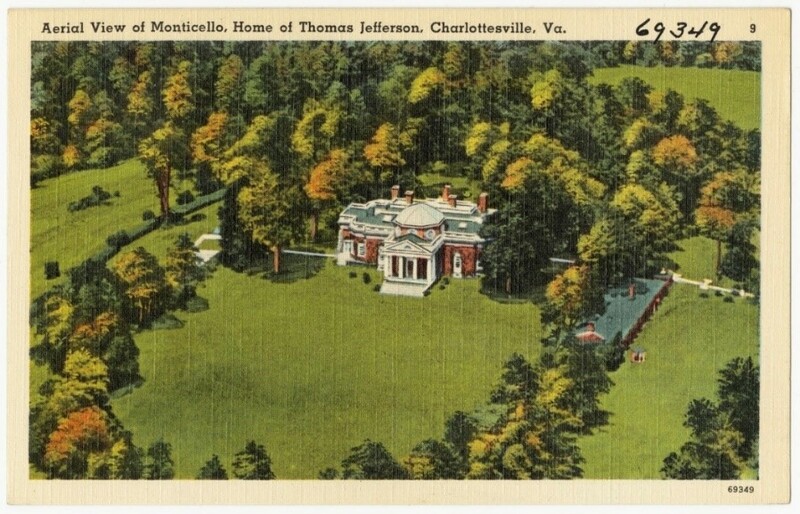 In Jefferson’s time, he writes, “Monticello must have been a delightful residence. 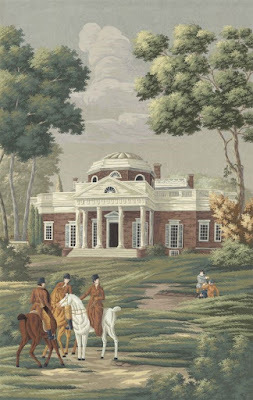 Now it is almost a deserted ruin, its occupants being a freedman and his family.” There may have been a former enslaved person and his family at Monticello that day, but it’s all but certain that Joel Wheeler, who was white, was the “occupant” of the house at this time. He would remain living there until Jefferson Levy obtained the property in 1879 from the other heirs, and sent him packing. 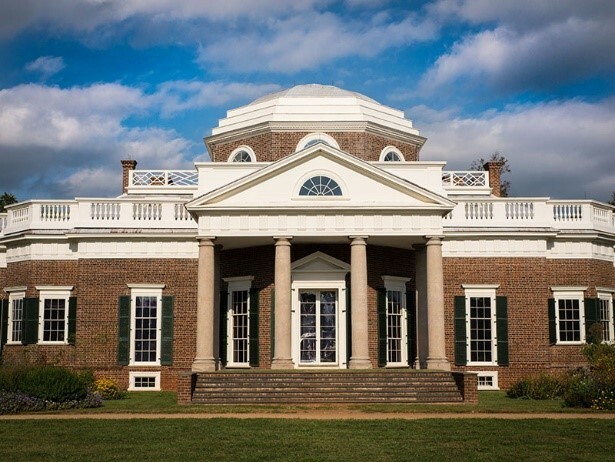 H.C. goes on to describe the house as “a very peculiar structure, its architecture being a copy of a building Mr. Jefferson saw in Paris, which struck his fancy.” That simply is not true. 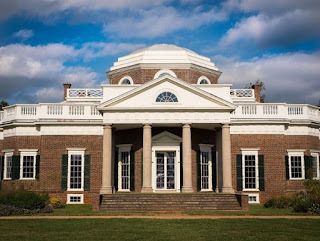 Thomas Jefferson’s Monticello is not a copy of any one structure. For one thing, he designed and built two houses at Monticello—tearing down most of the first one. For another, he was most influenced by the 16th century Italian architect Andrea Palladio—not by a building he saw in Paris. H.C. gets a D-minus for his knowledge of Monticello’s architectural history. H.C. and Judge Rives left the house and headed toward the family graveyard. Along the way, H.C. reported that the “timber of the mountain woods was being rapidly diminished,” probably by Joel Wheeler. The Jefferson family cemetery, which H.C. called a “burying-ground,” was “in a disgraceful state.” Its outside walls were “gradually falling to the ground.” Worse—and there are photographs (such as the one above) that bear this out—was the condition of Jefferson’s tombstone. 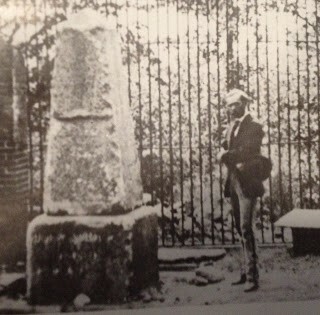 Over the years visitors helped themselves to chippings from the stone marker. I had no idea what “cabinet” meant in that context. But now I do, as an SM newsletter subscriber—my friend and colleague, the author and former Los Angeles Times art critic Cathy Curtis—emailed to fill me in. 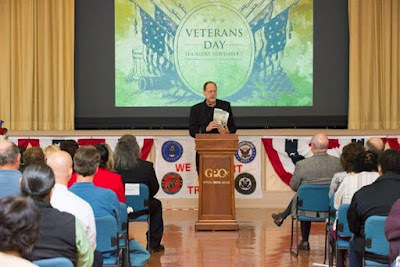 EVENTS: Just one in April, on the 13th for the Pentagon DAR Chapter in Alexandria, Virginia, on my book, Ballad of the Green Beret: The Life and Wars of Staff Sgt. Barry Sadler. My main event this month—and in the next dozen or so months—will be writing my next book. It’s another house history, this one about Huntland, a historic house and farm in Middleburg, Virginia. It was built in 1837 by William Benton, who supervised the building of Oak Hill, the nearby residence of President James Monroe. 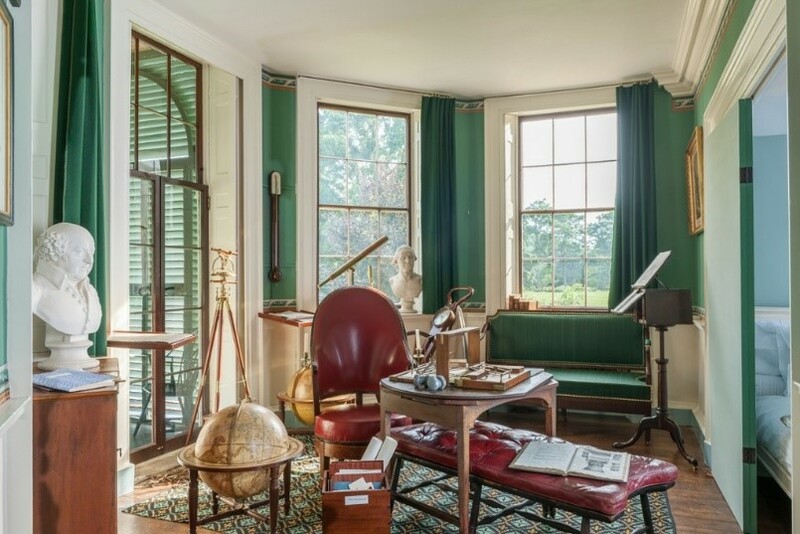 The history of the house in a way parallels that of Monticello, as Huntland went into a steep period of decline in the 1990s and early 2000s, and was saved from ruin, and beautifully preserved and restored, by the current owner, Betsee Parker. GIFT IDEAS: Want a personally autographed, brand-new paperback copy of Saving Monticello? Please e-mail me at marcleepson@gmail.com I also have a few as-new, unopened hardcover copies, along with a good selection of brand-new copies of my other books. ‘MONTICELLO AND ITS PRESENT OWNER’: That’s one of the subheads of an article in The Charleston (S.C.) Mercury on August 29, 1861. 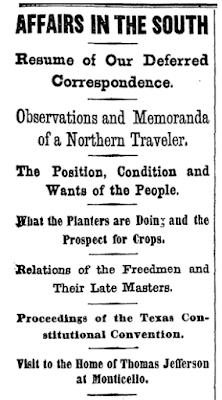 In it, an unidentified correspondent reports on a trip he made to Virginia, and includes a detailed account of his ride on horseback up the mountain to pay a visit to Monticello. The 1861 correspondent, identified only by his initials, “J.D.B.,” rhapsodizes about the scenic beauty he encountered as he made his way up the mountain, saying the “pretty range of hills” and a “magnificent” gorge were as imposing as anything one could encounter in Switzerland. He describes “the soft ‘swath’ of the scythe, the sharp clack of the mill where the circling horses are thrashing out the grain, the brawl of the streamlet, the glow on the distant fields, the dark, dank foliage of the frowning mountain in front,” all of which forms “so sweet a pleasure that one is unwilling to leave it for the hard ascent” to Monticello. Then he follows “a narrow path through the field” to “the front of the old mansion which crowns the brow of Mount Monticello.” He finds the house “built of good, durable brick, which has stood the ravages of the weather remarkably.” The “smooth shaven and well wooded lawn,” he writes, “encircle” the entire house. The correspondent does not describe meeting or conversing with any individuals during his unannounced visit to Monticello. 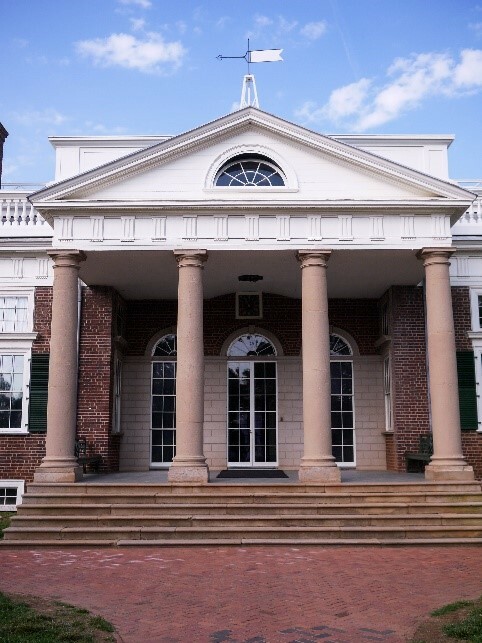 He talks about walking up to the Northeast Portico, the formal entrance where visitors today start the Monticello house tour. 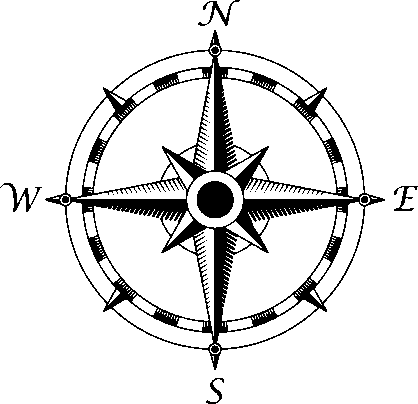 He takes note of “a large compass” attached to “the ceiling of the portico.” That would be a compass rose (above) that Jefferson had installed there. 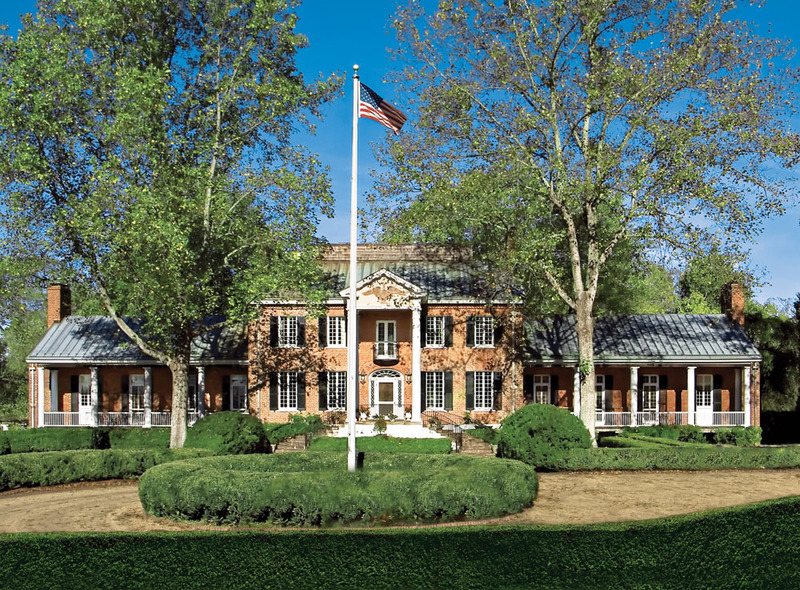 It was connected to the weather vane, which is still on the portico’s roof and can be seen in the photo—a Jeffersonian invention that allowed the former president (and amateur meteorologist) to read wind direction from inside the house. J.D.B. evidently was not aware that Uriah Levy held the rank of Commodore (the highest in the Navy at the time), and had been in the possession of Monticello since 1834. As for his suggestion that “Virginia” confiscate the house, the state never did, but the Confederate States of America, under its Sequestration Act, did take possession of Monticello, but not until November of 1864. That, again, is another story, and one I go into detail about in the book. After suggesting that Virginia take Monticello from Levy, J.D.B. ended his article by enthusing about the “transcendently beautiful” view from the Mountain. Not sure what “cabinet” means in this context. I welcome suggestions from readers. ‘TWO HORSES, BACON & FLOUR’: In last month’s newsletter issue I quoted from a rare account of Confederate troops taking a break from the Civil War in the fall of 1863 to have a picnic at Monticello. I pointed out that, luckily, no fighting of consequence took place at or near Monticello during the Civil War, and that the house and grounds escaped the fate of so many places in Virginia that were severely damaged or destroyed during the war. 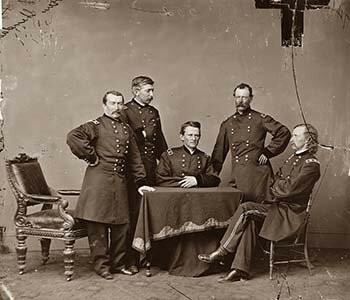 I mentioned that Union Gen. Philip Sheridan and 5,000 of his cavalrymen under the command of George Armstrong Custer occupied the city for three days, from March 3-5, 1865, and that—despite fears from the citizenry—they did not run amok, ransack, or burn the University of Virginia or Monticello. Noting that there are few surviving records dealing with Albemarle County under the Confederacy before September of 1864—and fewer still about the condition of Monticello during the war—the entry goes on to say: “The oft-repeated story that Confederate soldiers (who were as capable as any others in such matters) looted the house and carried away thousands of dollars’ worth of furniture has no basis in fact. 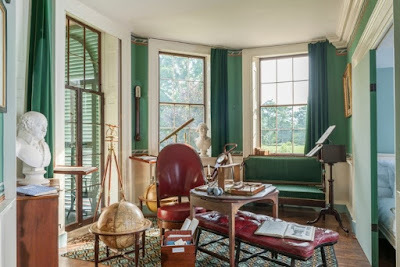 Joel Wheeler was the caretaker (who did not take very good care of the place) at Monticello from the mid-1830s until he was relieved of his duties in 1879 when Jefferson M. Levy gained control of the place. That’s another story—and one I relate in detail in the book. THE CIVIL WAR AT MONTICELLO: It’s difficult to throw a rock in the Commonwealth of Virginia and not hit a spot where some sort of Civil War event took place. Virginia was the scene of four years of troop movements and scores of battles and skirmishes, including the first and last significant engagements of the war—at First Manassas and Appomattox Court House. Virginia saw more than its share of the largest and bloodiest battles: at Chancellorsville, Cold Harbor, the Crater (at Petersburg), Fredericksburg (twice), Manassas (twice), Spotsylvania Court House, and The Wilderness. Luckily for its preservation—and as I noted in Saving Monticello—no fighting of consequence took place near Monticello during the war even though Charlottesville played an important support role for the Confederate Army. 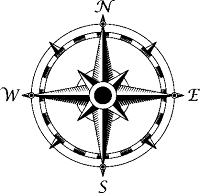 In a city in which the white citizenry was solidly behind the southern cause, several Charlottesville businesses provided clothing, supplies, and weapons for the Confederate Army. There was a 500-bed military hospital in the city and large shipments of supplies came through town via the railroad. Near the end of the war, Gen. Philip Sheridan’s Union troops, with some 5,000 cavalrymen under the command of George Armstrong Custer, occupied the city briefly, arriving on March 3, 1865. There were fears that the conquering Union troops would wreak havoc in the city, including burning the University of Virginia. That did not happen. When Sheridan’s men left town on March 6, 1865, they headed south toward Scottsville. Among other things, they took with them a significant number of formerly enslaved people who took advantage of the opportunity to free themselves. 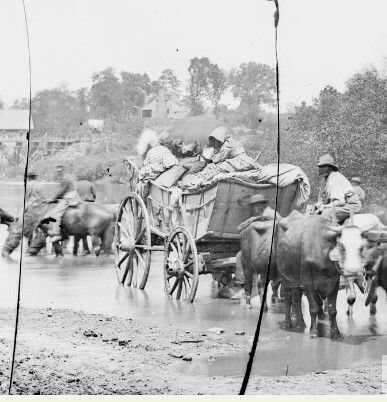 African Americans, fleeing slavery, crossing the Rappahannock River in 1862. The Union troops did not make a detour to Monticello, heading eventually to Petersburg, and then to take part in the surrender at Appomattox, about sixty miles south of Charlottesville on April 9. Starting in the fall of 1861, Confederate soldiers recuperating from their wounds in C’ville did journey up the mountain and had picnics at Monticello. 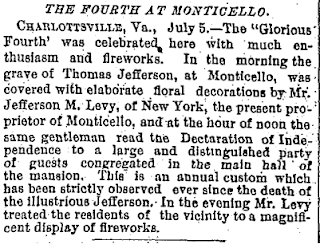 I didn’t go into detail about those rest and recreational visits in Saving Monticello, other than to say that it wasn’t uncommon for visitors back then to write their names on the walls of the upstairs dome room and to take souvenir chippings from Jefferson’s tombstone in the family graveyard. I recently came across a description of a Confederate troop Monticello picnic in the fall of 1863, one I had not seen when doing the research for the book. The day on the mountain included a “tournament,” according to Louise Wigfall Wright in her 1905 book, A Southern Girl in ’61: The War-time Memories of a Confederate Senator’s Daughter. “Some of the Knights—with only one arm to use—[held] reins in the teeth and dash[ed] valiantly at the rings with wooden sticks, improvised as spears for the occasion,” she wrote. On Tuesday, February 12, I will be doing a talk on the history of the American flag, based on my book, Flag: An American Biography, at the Lincoln’s Birthday luncheon in Alexandria, Virginia, following the official ceremonies at the Lincoln Memorial. If you’d like to arrange an event for Saving Monticello—or for any of my other books, including Ballad of the Green Beret—please email me. GIFT IDEAS: Want a personally autographed, brand-new paperback copy of Saving Monticello? Please e-mail me at marcleepson@gmail.com I also have a few as-new, unopened hardcover copies, along with a good selection of brand-new copies of my other books: Flag: An American Biography; Desperate Engagement; What So Proudly We Hailed: Francis Scott Key, a Life; and Ballad of the Green Beret: The Life and Wars of Staff Sgt. Barry Sadler. ‘TO CONSIDERABLE EXPENSE’: Twenty years ago when I was doing research for Saving Monticello, my main goal was to find as much primary-source material as I could to show as conclusively as possible that both Uriah Levy and his nephew Jefferson M. Levy did, indeed, “save” Jefferson’s house and grounds from ruin. 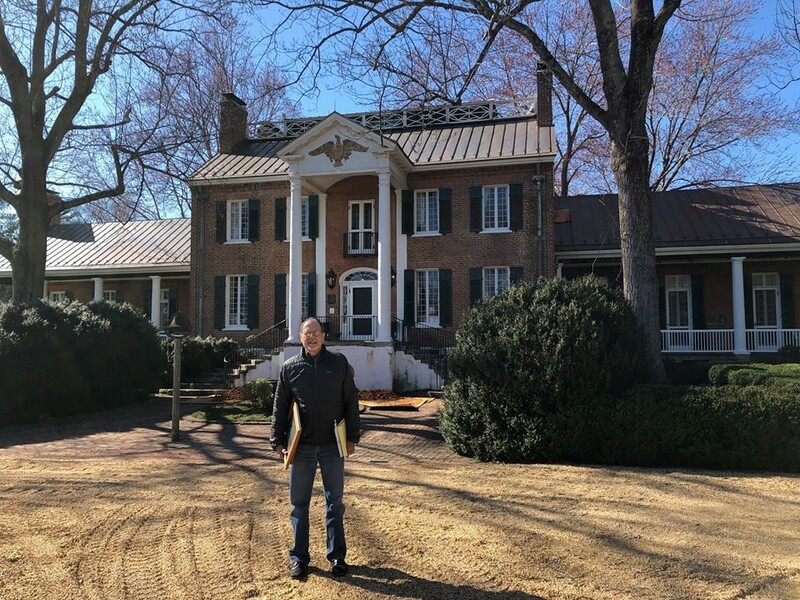 I wound up digging up plenty of letters, newspaper articles, journal entries, official documents and photographs, and other credible evidence to confirm the premise of the book, that the Levys did save Monticello—Uriah during his 1834-62 ownership, and J.M. Levy during his time starting in 1879 when he bought out his uncle’s other heirs and took control of the place, to 1923, when he sold Monticello to the Thomas Jefferson Memorial Foundation (now the Thomas Jefferson Foundation), which owns and operates Monticello today. One piece of confirming evidence I didn’t come across back then was a short article that appeared in The Washington Post on June 2, 1886. I’m guessing it hadn’t been scanned till recently when I found it on the Proquest Historical Newspapers site, which I often check. *THE FRONT STEPS: When I wrote those words I missed the fact that in Jeffersonian architectural terms, there are no “front steps” or “back steps” at Monticello since neither of the two entrances is the house’s “front.” Instead, Monticello has an East Front and a West Front. 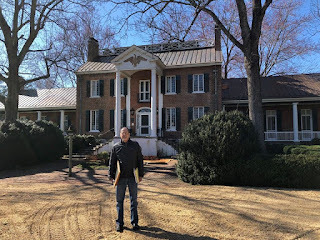 EVENTS: No events in January as I continue researching my next book, a house history of historic Huntland, here in Middleburg, Virginia. The pub date will be early in 2020.